However, the NOTA option is only a way to give negative feedback and it doesn't guarantee the winning candidate's dismissal in any manner. It is only an option for voters to specify that they don't have confidence in any of the contesting parties or their candidates. In September 2013, the Supreme Court ruled that the voters' right to NOTA (none of the above) vote in elections should apply. The NOTA option wouldn't impact the election results. 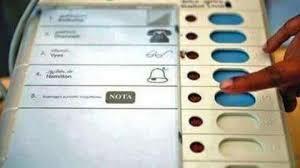 According to a 2014 report, a senior EC official said the NOTA option doesn't have electoral value.